Now you can play the actual card wars game from the show! Based on the original Adventure Time episode featuring “Card Wars,” where Jake begs Finn to play his favorite trading card game. Eventually, Finn and Jake battle against each other to decide who will be the Dweeb and who will be the Cool Guy. Finn’s Blue Plains deck features Creatures from the episodes such as the wise Ancient Scholar, the aptly named Cool Dog, and the most fearsome critter of all… The Pig! And many more. Jake’s Corn deck features Creatures from the episodes such as the powerful Husker Knights, the intimidating Legion of Earlings, the heroic Archer Dan and many more! 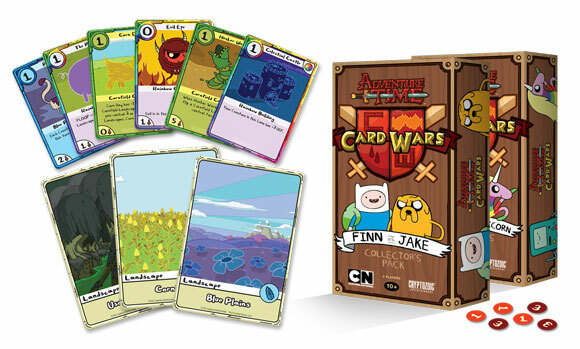 Based on the Card Wars game first introduced in the Adventure Time episode of the same name. Includes code cards that unlock special surprises in the Card Wars digital iOS game. Being an Adventure Time nut – I have been wanting to try this. I had gotten the app for my phone, and even though the game play is very different, I am glad it is. I find it hard to find a satisfying game for two players – and this fits the bill nicely. Great artwork and fun translation from the episode. During play, we figured out how to mix up the landscapes – and I do wish the directions covered that better, especially considering the two decks were random and not organized for Blue Plains/Finn for Cornfields/Jake. Looking forward to getting more cards and the BMO vs Lady Rainicorn set. Add a Review for "Adventure Time Card Wars: Finn vs. Jake"